Hymosycandles founders, Maggie and Nichole, both mothers of two babygirls. They often share the scents when family parties and prepare gifts, that inspired them to make cleaner, healthier candles. Starting off as hobby and making began in blank jars and pots. Then they found that tins with lids will stronger, safer and easy taken while travelling. They shared their creations with family, friends and suddenly they started getting more requests for candles. After the original candles were produced, hymosy has grown into a thriving company that continues to produce 100% natural soy wax candles. The Hymosycandles is simple but authentic, No paraffin added and no lead in the cotton wicks. Each pure soy candle was carefully crafted and hand poured. Made with biodegradable and Eco-friendly ingredients, Hymosycandles provides a safe and clean-burning! Join us, share the scents! Say yes to fresh fragrance with great lifestyle! Bring aromatherapy into life every day. Our scented tin candle have strong fragrance make a pleasant ambiance, help to stress relief and relaxation, perfect for self-use, family use or hostess gift. Candles are portable. You can easily pack your candles into your luggage when traveling and can bring them with you to your lake house or anywhere else you may need to unwind. 100% Soy Wax provides a clean burn. 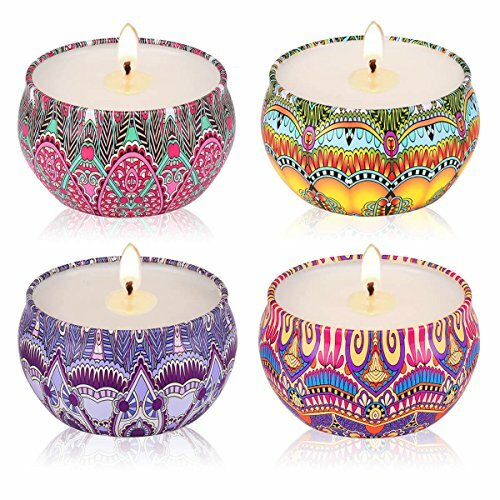 These candles are made of naturally biodegradable and eco-friendly pure soy wax, which are hand poured wax infused with essential oils to create a highly fragrance Aroma.